We here at Home Theater Review are huge fans of Roku--especially the Roku Ultra variety--but sometimes, in guest rooms, kids' rooms, or even the master bedroom, you don't really have the space or the need for a full-fledged AV system with separate components. Heck, you might not even UHD in these spaces. If any of the above sounds familiar, you might be interested in the new Roku TVs coming from Funai under the Magnavox brand. The new displays aren't exactly scale-busters--coming in at 32 and 50 inches, with 720p and 1080p resolution, respectively--but if you're looking to cut the cord as hard as it can be cut, the new displays certainly fit the bill. You can even add your own storage and pause live OTA TV for up to 90 minutes. Funai Corporation, Inc, today announced the availability of the first Magnavox TV series under the Roku TV™ licensing program. 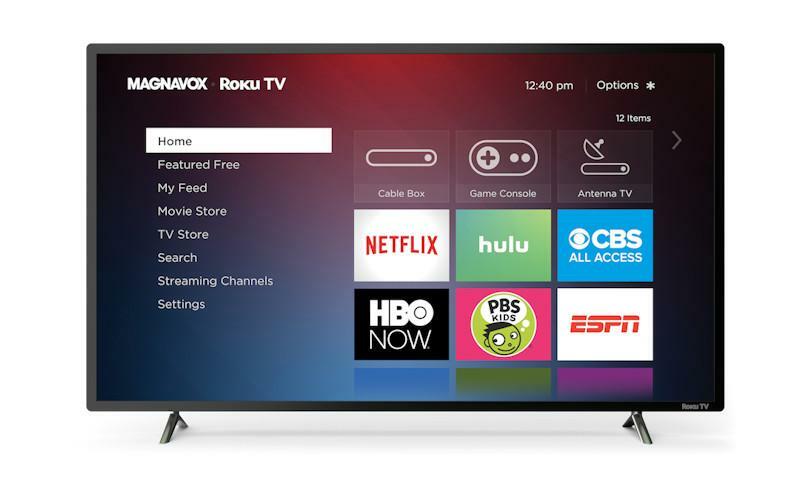 The new Magnavox Roku TVs will feature the Roku OS offering an intuitive home screen, easy to use remote and access to 500,000+ movies and TV episodes alongside other inputs like cable boxes, HD antennas and game consoles. Debuting this month in the U.S. at BJ's Wholesale Club and coming soon to Sam's Club is the 32-inch 720p LED LCD Magnavox Roku TV. Additionally, a 50-inch 1080p Full HD Magnavox Roku TV model is also set to be available soon. "Smart is no longer expensive," said Youssef Ibrahim, Sr. Product Marketing Manager. "With the Magnavox Roku TV, every room in the home can easily and affordably be a portal to great content and entertainment experiences!" The Roku OS offers access to thousands of free or paid channels and the ability to search across hundreds of channels and see results in order by price, including what's playing live if there is an HDTV antenna attached. Access to free content is easy to find with The Roku Channel, which offers access to award-winners, cult classics, live news and more with no subscriptions and no fees; and Featured Free provides users with direct links to free in-season episodes of top network shows and full past-season catch-ups. Smart Guide, an electronic program guide, seamlessly integrates information for local broadcast TV via an antenna with streaming options allowing customers to search for, find and discover entertainment. For HD antenna users, connect a 16 GB or larger USB drive to pause up to 90 minutes of live TV. The new Magnavox Roku TVs will receive automatic Roku OS software updates including the ability to control Magnavox Roku TVs with Google Assistant devices when the functionality rolls out in the coming weeks as well as the recently announced Roku OS 8.2 and Roku OS 9.0. Roku OS 8.2 is expected to roll out to Roku TVs beginning this month and enables users to access and control iHeartRadio, Pandora and TuneIn by voice. Roku OS 9.0 will begin rolling out to Magnavox Roku TVs in early 2019. The easy-to-use Roku remote is designed to fit comfortably in hand including one-touch access to popular channels. Search with a keyboard, use voice search, enjoy private listening and cast to the TV all via the free Roku mobile app for iOS and Android devices. Via Wireless LAN 802.11ac MIMO, the Magnavox Roku TVs easily connect to wireless networks. The models provide a wide range of connectivity features, and it's perfect for connecting gaming consoles, set top boxes, and other HDMI 2.0 compliant devices. The HD viewing experience features Brilliant Motion Rate (BMR) 120 with advanced backlight control technology to ensure clarity and sharpness, Progressive scan, and to perfectly compliment the viewing experience. The Magnavox Roku TVs provide clear and balanced surround-sound audio from Dolby. • Visit the Magnavox website for more product information.